Editorial: Three Months at a Glance. Dear readers of the “Russian Art & Paris” journal! 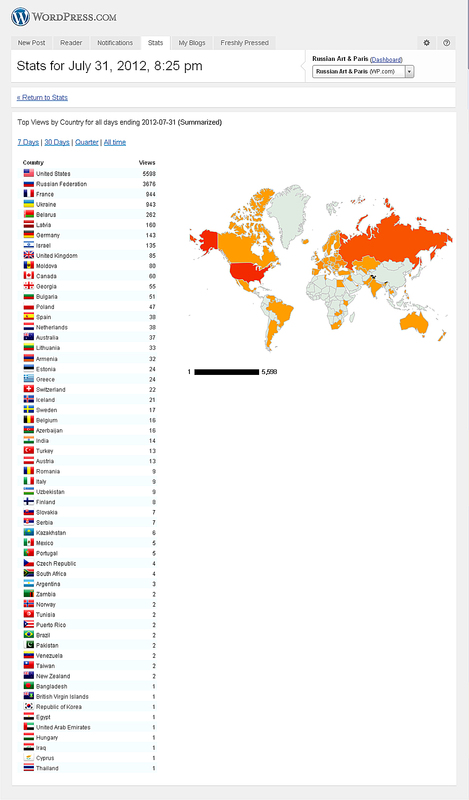 Within the three months of existence of our publication, its virtual pages have been visited by art lovers from around the world. We welcome every one of you! Your letters, which we receive every day, are also the subject of our constant attention. Some of your requests we fulfill immediately and with great pleasure, like when asked by Mr. Heimann from Vienna to: “Please put me on your mailing list now. Thank you, Peter Heimann – Vienna, Austria“. Dear Mr. Heimann, your name and e-mail address will henceforth and forever be in our mailing list as number one. In most cases, your suggestions about our publication require much more serious thought. Please be patient. In any case, every single letter is read, you can be absolutely sure of that. Today, we are especially grateful to our authors – art historians and critics, who along with us began creating this journal from a blank editorial desk. Their faces and biographies of creativity traditionally remain “behind the scenes”, but their presence in the art world is no less important than the presence of the artists themselves. Viewers need them both. The journal has just begun, not all sections have been deployed and not all categories are open yet, but the main thing that we have today is you – our readers! Who you are and where you are from can be best described by the visit statistics, which we bring to your attention now.